Kerr Deck Lights Give your wooden or Trex deck and dock areas the necessary directional lighting, as well as an attractive, sophisticated appearance. Base is a neutral colored tan. One of the major reasons a homeowner installs a deck in the backyard of the home is to create a comfortable and spacious area for entertaining family and friends. Showing off that beautiful deck once the sun begins to set and making the deck area and any nearby steps safe for the homeowner, family members, and friends who frequently enjoy the backyard deck are the two most important reasons for installing Deck Lighting on and around the deck. Additionally, the same reasons for installing appropriate lighting on and around your deck apply to the dock where you store your prized sailboat or power boat. A number of different types of outdoor lighting fixtures can be used in a Deck or Dock Lighting plan. It is important to choose outdoor fixtures that have special weatherproof features. 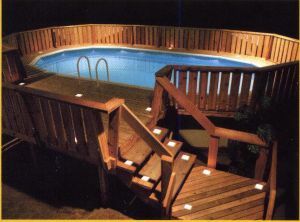 Deck and rail lights are specialized outdoor fixtures specifically designed to work on and around deck and dock areas. Post lamps and wall-mounted fixtures are two additional examples of lighting options often used to provide ambient light around decks and docks. Deck and Dock Lights are an exciting breakthrough in exterior illumination. They will give your wooden deck and dock areas necessary directional lighting and create an attractive, sophisticated appearance. These lights not only enhance the look of your property, but also provide you with additional security. When used in appropriate areas, they can enhance the safety of your home or boat and its surroundings. Our Deck and Dock Lights are available in 2 different Do-It-Yourself Kits, Individually, and in Boxes of 20 Lights. At trick that we use at TJB-INC, is to place a white napkin on top of the area where you think a light should go. (You may need to use tape or a rock to keep the napkin from blowing away.) Then stand back and see how it looks. It is much easier to move napkins that it is to move light fixtures. Adjust as you feel necessary until you find a lay-out that you like. Then you will know how many lights you will need to order and install to complete your project.